So here we are again, and this time we would like to share with you one of the most special weddings from last season. But before starting, as every time, we would like to thank A&B for choosing and trusting us and making us partakers of this special day. Also, we would like to express our gratitude to all the suppliers which were involved throughout the day. We know that it was not an easy thing to make this day come true: many hours invested not just in the planning, also in the designing and scheming of the whole day. So a big thanks to all of them, we could not have made it without you all! 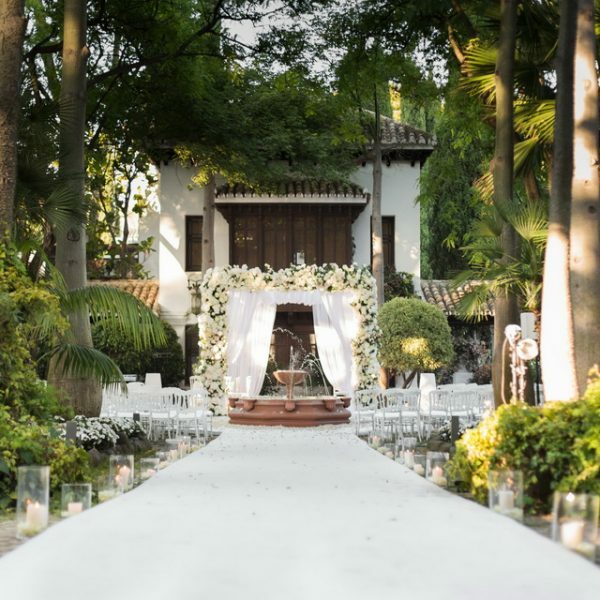 The wedding was held in a traditional Andalusian villa with large and green gardens all surrounded by bushy flora. A&B’s wedding was unique in every single detail. They knew from the beginning that the day was special enough to everyone that everyone should be considered as a big element on the day. That’s why the entirely day was designed to create that sort of atmosphere you could find in any friends or family reunion, where not just them were the main characters, also their beloved ones. To create this open and welcoming atmosphere we decided to have just three long tables. This way the conversation between all guests was more than assured!! Also, the food was an entirely experience. Food was served in pans placed in the middle of the tables reminiscent of the large family meals where everyone could eat from the same dish. The lighting was also an important factor, that’s why we were certain that the use of small lamps would transport all guests to those relaxed and cosy French bistros. The main colours used were: turquoise, yellow and pink. That’s why we could find along the different areas of the event elements on those colours such as lemons, small wild flowers arrangements hanging from the trees and small pomegranates in turquoise. The language of the symbols was also extremely latent during the whole wedding. The pomegranate symbol of love and of the strong relationship between the beloved couple. The barley used on the bridal bouquet which was specially brought from the crops of the family of the groom, and it represented the new bond of union between the bride and the groom’ family. Or even the olive leaves, which in the Greek mythology symbolizes peace and prosperity, as well as resurrection and hope. Persian traditions are known by the countless use of symbols and their meanings. For explaining them all we would need at least one or two additionals posts, that’s why we prefer to leave it for a different time. The evening could not end otherwise than dancing under the lights of an amusing disco ball to the rhythm of the Gypsi Kings and the sound of African drums. Although not all guests had energy left for that, so some of them decided to make use of a cosy chill out dressed in Arabian fabrics, cushions, puffs, candles and warm blankets for the chilly ones!